All the percussion instruments played by a single musician, the drummer. Part that supports the drum; its rubber end prevents the drum from sliding along the floor. Drum that makes a muted sound; it is struck with a mallet or a drumstick. Retractable metal rod attached to the bottom of a bass drum to stabilize it. Device that controls the mallet used to strike the membrane. Metal rod whose end (made of felt, cork, skin, etc.) is used to strike the membrane of the bass drum. Part on which the bass drum and the pedal rest. Part that adjusts the tension of the membrane. Large drum set on a vertical frame and struck using a pedal-controlled wooden mallet. Solid base with three feet. Flat drum consisting of two membranes; stretched across the lower membrane are snares that produce a rattling sound. Stretched membrane on a snare drum that is struck with a drumstick or a wire brush. Instrument consisting of two cymbals; the movable superior cymbal, controlled by a pedal, is used to strike the inferior cymbal. Instrument consisting of two single-membrane drums struck with a mallet or a drumstick. 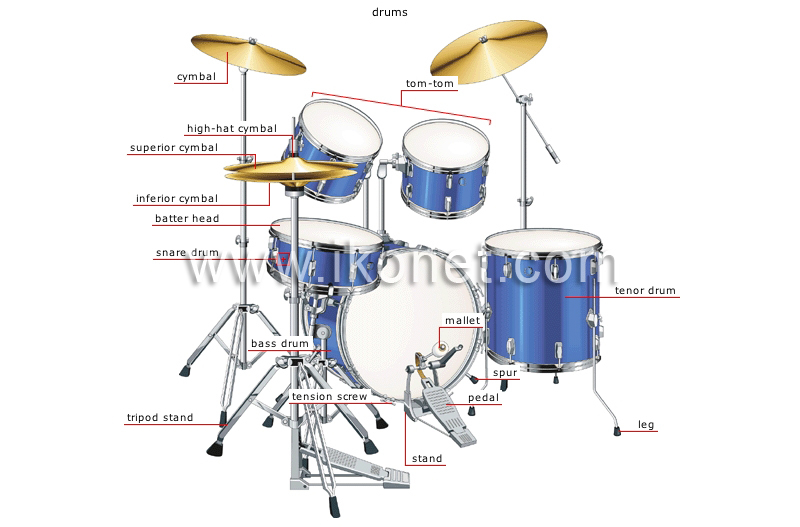 Instrument consisting of a metal disk mounted on a stand; it is struck with a mallet, a drumstick or a wire brush.